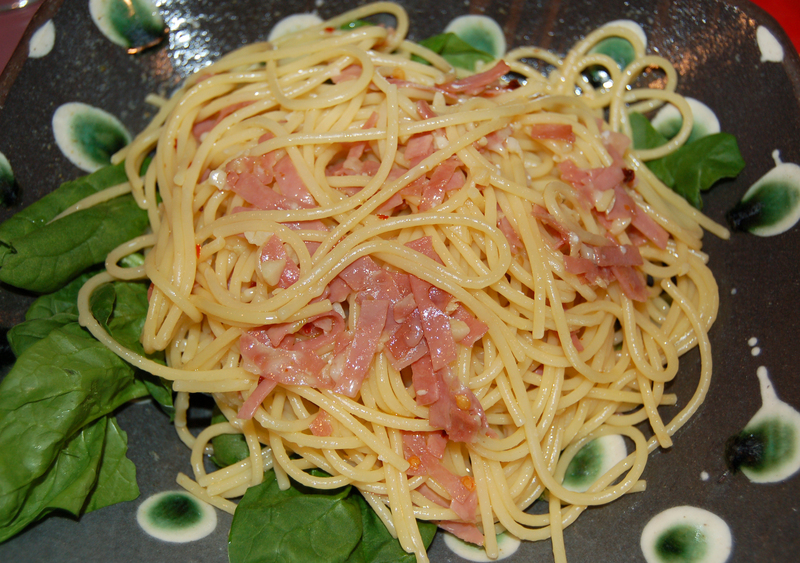 QUICK Spaghetti with Garlicky Olive Oil & Mortadella (romantic dinner for 2) | Crappy Kitchen - Good Dinners! There was a very strange and unusual occurrence this past Saturday evening at my house: we were without children for the night! They each had impromptu sleepovers with friends and so at about 7.30pm on Saturday, I found myself in the kitchen, alone. My man Dave was not home yet and all sorts of thoughts about what we should do with this precious time popped into my head; go to the movies, play music really really loud in the house, order takeout for dinner, read a book, have a party??? None of the above really appealed (except the bit about playing music loud, which I did before Dave came home! ), to me so this is what we did. We both sat in the kitchen drinking wine and chatting while I made us dinner. I made something that was un-fussy but still managed to make the house smell wonderful. That’s one of the reasons I hate takeout: no good kitchen smell lingering in the air as you eat! 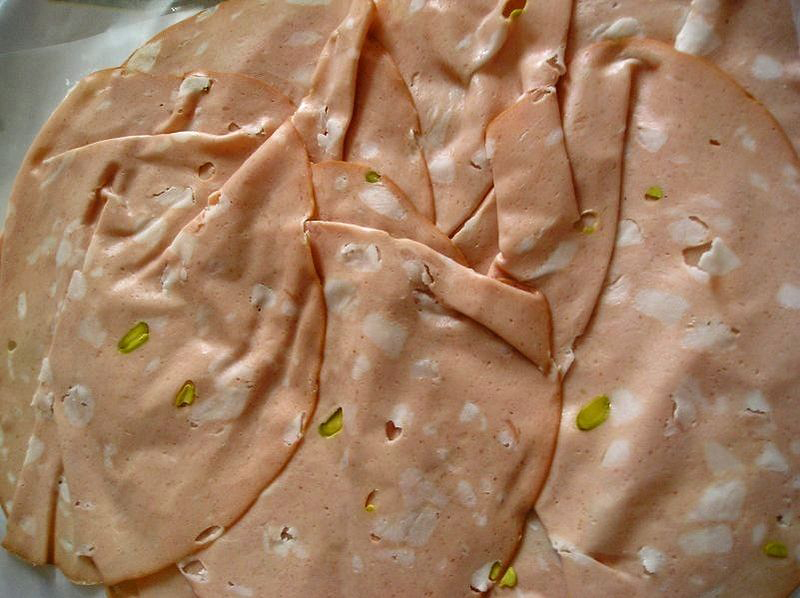 Mortadella from Bologna. Mortadella hails from Italy and is a large finely ground heat-cured pork hash that is compressed into a large sausage shape. It has added cubes of pork fat and spices. It can also contain things like black pepper, berries or pistachios. I like the pistachio version the best. You can find it at really good delicatessen counters or Italian grocery stores. It’s great thinly sliced on sandwiches or used like I did: chopped and added to a pasta dish. The thing I didn’t want to do was shop for ingredients, so I made do with what I had. I had lots of garlic, and there is always olive oil and pasta in my pantry so that settled it. I wanted to make a simple garlicky oil that my spaghetti would lovingly cling to. I also had a few ounces of mortadella (read about it above) that was on the verge of expiring so I decided to fry it with the garlic. Mortadella has good fat content so I knew it would add to the oily sauce in a yummy way. The reason this was a “romantic” dish is simply because we were alone! But, I do think there is something romantic about pasta. It is so instantly satisfying and appreciates olive oil and garlic the way I do. Pasta like spaghetti, is also fun to eat right out of the pan while the person you love twirls their fork next to you. 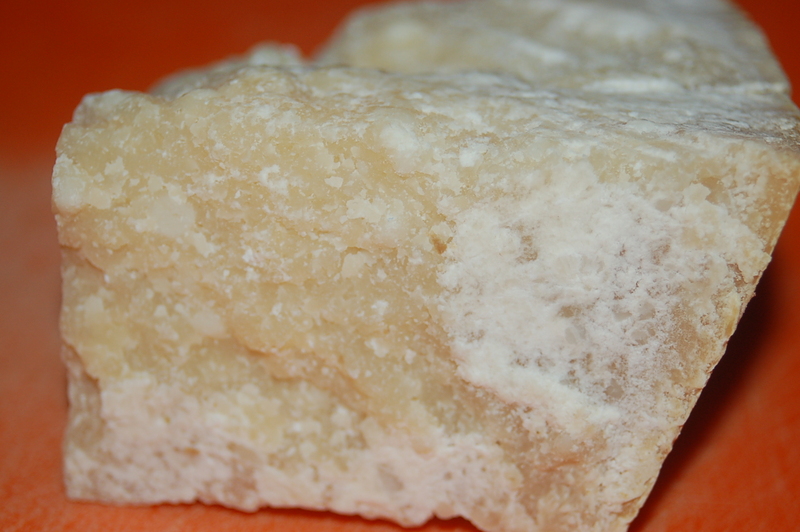 The other love affair I have is with Parmigiano Reggiano cheese. I adore this grainy, strong and heavenly cheese with a passion – surly that merits romance! Dave add some fresh crunchy spinach to his plate before helping himself to mounds of pasta. We ate heartily until there wasn’t a stand of spaghetti left. It was true pasta love! 1 – Put pasta water on the stove top immediately with a good teaspoon or two of salt and a little olive oil. Cook according to instructions making sure to not over cook. Scoop out a cup of the hot pasta cooking water right before draining and set aside. 2 – Put large saute pan on medium heat and when it has warmed add the oil. Add the garlic to the pan and stir it into the oil. After about 2 minutes (don’t have the heat so high as to allow the garlic to burn or brown! 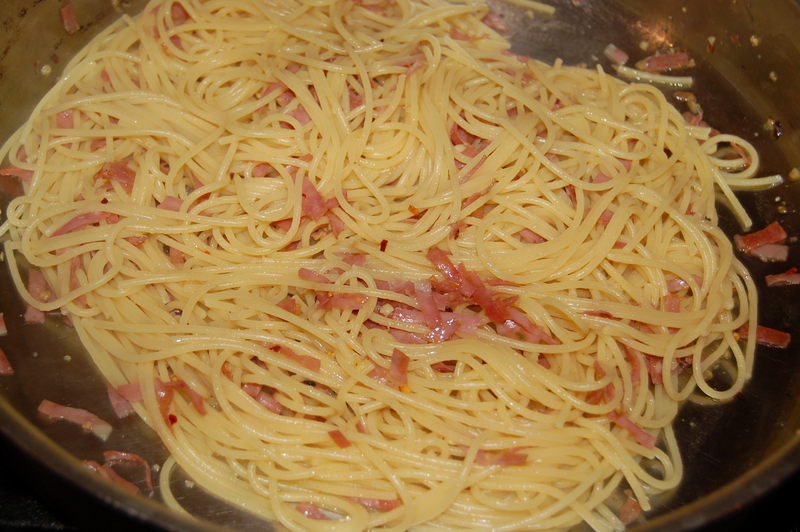 ), add the cayenne pepper flakes (if using) and the chopped mortadella. Cook for about 3 to 4 minutes stirring frequently. 3 – Have this timed so the pasta is cooked at the same time (in other words, start your garlic and oil about 5 minutes before the pasta is ready to be drained) and add immediately to the garlicky oil. Add a little pasta cooking water (about a 1/4 cup) to loosen it up if it needs it. Add the cup of grated cheese and stir it into the pasta dish. Taste for addition of salt and/or black pepper. Remove from heat. Serve in warmed bowls with drizzle of extra-virgin oil and some more cheese (if you have a really good quality oil that you save for special occasions, now is the time to break it out!). This entry was posted in dinners and tagged Blood Type A diet, blood type A dinner, blood type A recipe, dinner for two, mortadella, pancetta, Parmigiano Reggiano, pasta for two, quick pasta dish, romantic dinner at home, romantic pasta dinner, spaghetti and oil, spaghetti dinner, spaghetti with mortadella. Bookmark the permalink.